When you use a calculator to evaluate most trig values, you will get a decimal approximation. You can use your knowledge of the definitions of the trigonometric functions, reference angles, and the ratios of the sides of the 45°-45°-90° triangle and the 30°-60°-90° triangle (“special” triangles) to get exact trig values for “special” angles: multiples of 30° , 45° , 60° . 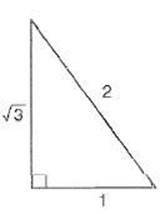 The ratios of the sides of the two special triangles are shown in the figure below. 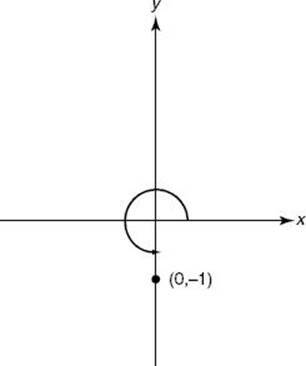 To illustrate how this can be done, suppose you want to find the trig values of 120° First sketch the following graph. Values can be checked by comparing the decimal approximation the calculator provides for the trig function with the decimal approximation obtained by entering the exact value in a calculator. In this example, sin 120° 0.866 and . You can also readily obtain trig values of the quadrantal angles—multiples of 90° . 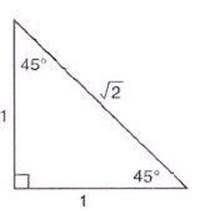 The terminal sides of these angles are the x- and y-axes. In these cases, you don’t have a triangle at all; instead, either x or y equals 1 or –1, the other coordinate equals zero, and r equals 1. 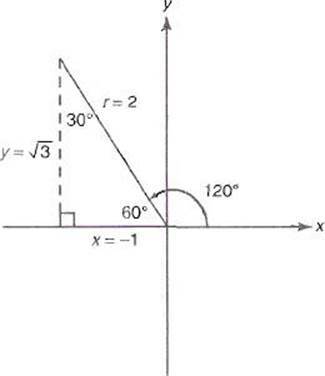 To illustrate how to use this method to evaluate the trig values of 270°, first draw the figure below.